The buzz about Birdman was flying high and ruffling feathers long before it landed in cinemas over here - but the question remained: Would it be the golden goose or an utter turkey? OK, enough, I'll stop now. But the point remains - can a film that whips up such hype ahead of release live up to perceived promises? Boyhood, for example, didn't, instead making me wish the child star had gone off in a sulk three years into filming. Birdman, on the other hand? For a start, the Boyhood comparison is worth noting as both got the critics in a tiz with a "new" approach to filming. Where Boyhood shot endless scenes over 12 years (WHY????? ), Birdman took a different approach, trying to create a whole film out of a single take. Or at least look like that was the case. And it's this kind of arty approach that critics fawn over. It kind of works too, in that the scenes don't feel drawn out and over-long. They are genuinely engaging. This is mainly down to Michael Keaton, the star of the piece taking centre stage as Riggan, the former movie star now trying to make his name on Broadway. It's here, though, that the film starts to fall down a smidge. Focusing as it does on the staging of a play, you can't help but watch it and think constantly of Noises Off (Michael Frayn's play about what goes on backstage at a play). It doesn't help that a lot of the dialogue actually sounds like it was written for a play - an not the dialogue that is meant to have been written for the play, but the other dialogue that was written for when the film was about the film and not the play. And the film isn't totally sure what it's trying to say. Essentially it's about Keaton's nervous breakdown as he struggles to break out from being known as the guy who made Birdman, but other ideas and tropes get slung in all over the place. Pick any one. You'll find there's something I've forgotten just behind it. All of which adds up to a slightly muddied feel to what could have been a brutal black comedy. And director Alejandro G. Inarritu (I can't be arsed finding the accents) clearly meant this film to feel this way, because if it's not the myriad messages and themes bombarding you, the whole thing is set to a weird off-kilter percussion beat that keeps you slightly unsettled. Granted that doesn't sound like fun, but it's actually one of the most enjoyable bits of the film - especially when the drummer ambles into shot. Despite all the negatives, though, this is not a bad film - even if it's not as great as many would have you believe. Edward Norton puts in one of his finest performances, Naomi Watts remembers how to act, and Emma Stone and Zach Galifianakis are both as good as ever. The film belongs to Keaton, though, and he is the reason the film is as good as it is. He perfectly captures Riggan's stresses and fears, and makes you fall for and root for a man who is so self obsessed he's only now realising how much his daughter needs him (20 years too late, sure, but hey...). 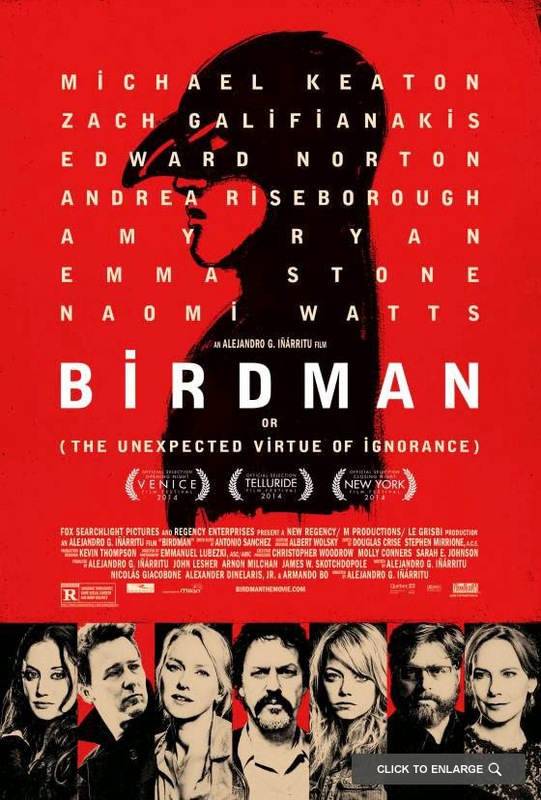 It's slick and stylish, and Keaton shines, and it will hoover up awards - but Birdman is still style over substance. It's looking for things to say rather than having a coherent message, and like Boyhood is too long for it's own good. But, when all is said and done, it's great to see Keaton produce one of the finest performances of his career.